I am very excited about this weeks menu plan. All of our activities are in full swing so this week will be a good test of how successful I will be at staying with what I have planned. Scouts, soccer practice, dance and a PTO meeting will all try to throw me off my game, but I am determined to stay the course. Need menu ideas? 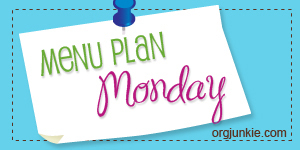 Want to share your menu plan? Visit Laura’s blog.